Think of the last time someone asked you something you didn't have the answer to. What was your response? There are alternative phrases that are much more helpful than the obvious brush off a standard "I don't know," provides. Here are four you can use the next time you don't have an answer. 1. "I'll find out. "This response is a tried and true fallback for a reason--it's both supportive and self-assured. Replying with a disregard of your shoulders and a rude, "I don't know," shows that not only do you not have the answers, but you also aren't willing to put in any work to find them. In contrast, assuring someone you'll do the legwork to get the information that's needed makes you look like a cooperative, valuable, and resourceful team player. 2. "I have that same question. "There are those moments when you just don't have the answer. But, beyond that, you also have absolutely no idea where you'd even begin to look for it.In those cases, you're better off satisfying your conversational partner that you're seeking that same information. It achieves the same thing as saying, "I don't know," -- it clearly states that you don't have the answer that's needed.However, it goes one step further and unites you with that other person. Rather than looking like you're simply trying to avoid the question, you're both in favor and joining in on the mission to get the required information. 3. "My best guess is..."Unfortunately, sometimes an educated guess is the best you can do. You're put on the spot, and you need to draw a conclusion based on the information and evidence that's directly in front of you.It's in those cases when you should offer some sort of explanation based simply on what you know -- making it clear that your answer is simply a theory, of course.You won't want your guess to be accepted as hard fact. But, at the same time, you don't want to come up short and seem like you're trying to completely avoid the question.So, go ahead and share your hypothesis or a few ideas. 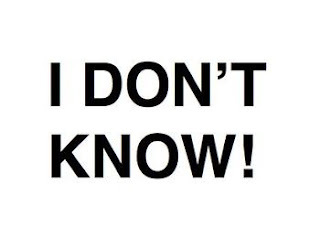 If nothing else, it's a much better launching point for brainstorming and discussion than a simple, "I don't know." 4. "Why don't we ask [name]? "What should you do if you're truly not the best person to be answering this question? What's the best way to handle that context, without relying on the trusty three words you've grown habitual to?It's simple: Own it. Admit that it's not quite in your wheelhouse, but that you can undoubtedly find the person that's best for the job.You might feel like you're shirking responsibility or trying to pass the buck. But, in the long run, you're smarter to send things along to the people who are best equipped to handle them. It's both more effective and more efficient.